Students tend to be dissatisfied with working on their group assignments. 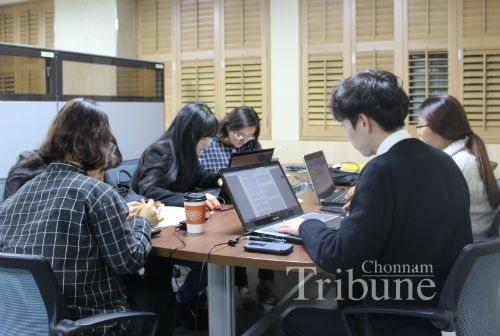 Group work has become popular at universities, but so many students hate it because some students do not participate in performing a group assignment with excuses or even ignore all the calls from other members. In spite of the fact that many students often suffer from such a problem, they have no power to control them and there is no a proper system for dealing with complaints from students or preventing free riding. The extreme case is that if one member goes off the grid, other members of the group should undertake more tasks and then it can cause internal discord. This free rider problem is the main reason why students do not like group assignments. This article examines the free rider problem by listening to students’ voices and suggests ways to improve group work. ▲ Five members of a group were developing functional norms and roles to work together toward a common goal. 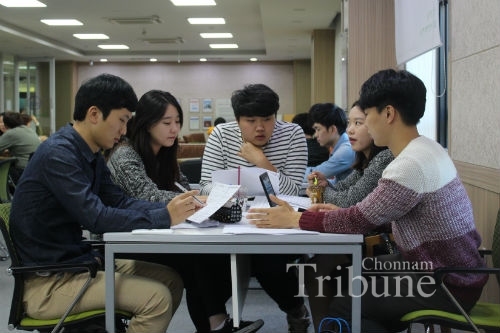 From October 6th to 8th, the Chonnam Tribune surveyed 200 students who are attending Chonnam National University about group assignments. Almost all the students surveyed answered they should usually carry out more than one group assignment during a semester; one at 16 percent, two at 32 percent, three at 25 percent, four at 14 percent and five at 12 percent. However, when we asked, “Are group assignments necessary for classes?”, only 40 percent of respondents said they are necessary for classes, 28 percent of students said they are unnecessary. These survey results mean that in almost every class the team work is required for students but they are inclined to think that it is not an effective teaching and learning method. It is paradoxical that students agree that the group assignments are needed for class but they do not want to do it in reality. The main reason for that is the free rider problem. The free rider, regarding group work at universities, are students who do not participate in group activities but receive the same grade as other members. There are many cases of students confronting free riders while they are doing group assignments. When someone does not take part in a group assignment, one of other members should fulfill her/his share instead. However, all the group members get the same grade. It is not fair and of course many students are not satisfied with such a result. ▲ All members were making a serious commitment to show up and to do the required group assignment together. However, it is difficult that students have to write down a free rider’s name in a report or remove her/his name in a report. When students are dealing with a free rider, 54 percent of students surveyed said they just encourage free riders to participate. Only 20 percent answered they remove a free rider’s name in their report. 13 percent said they ask for advice from a professor. Lee Jung-hyup (Junior, Dept. of Environment and Energy Engineering) said, “I have faced several free riders. Actually, it is not easy to omit their names from the report. In addition, I still have to face the free riders after finishing group assignments in the same classes. It will be uncomfortable to omit their names from the reports. So I prefer to suggest to them to participate in working on assignments.” Students have been usually told that it is not desirable to accuse someone since they were a child. Also, they do not want to get on the wrong side of a free rider student because it might be uncomfortable during the rest of the semester. The free rider problem could not be resolved or improved by students’ individual control. Institutional strategies and guidelines at the university level are needed in order for students to achieve successful and effective teamwork. ▲ A member was performing his task to make presentation slides. It is easy to find out free rider stories on personal blogs or SNS posts. Some students even attach a hand-written poster on the bulletin board at the university to inform the seriousness of the freeloading problem and the necessity of an efficient and fair evaluation system. Students have emphasized the freeloading problem reduces the effectiveness of group assignments and activities. To reduce free riders for required group assignments, it can be a solution that tips and guidelines for effective teamwork are provided to students. Also, professors need to manage group dynamics so that all group members contribute equally to the group assignment by listening to students’ opinions whether they are suffering from the free rider problem or not. It is also another solution to implement student peer evaluation system for a fair and effective evaluation based on each member’s performance. However, there is not a perfect solution to the common problem in group assignments. It is most important that every student tries to be involved equally and productively in group activities. It is obvious that group work is one effective teaching method which can enhance students’ learning and develop their problem solving and communication skills. If group work is well designed and managed, so many students would not have to feel burdened about group assignments.